“You see, Tapa is learning to bear. Some people have this by nature. They are very meek and timid. But others consciously cultivate it. Howsoever exciting the situation, they don’t lose their cool and carry on. This becomes their nature and eventually they are appreciated. So they are able to carry out their job, carry it out peacefully and in the end, they are happy also; as against those who want to show off their anger, who speak out loudly, in the process they create animosity. The work gets affected and they suffer. In fact, this quality of patience is one that has to be consciously cultivated for one’s own spiritual growth because the things in the world, they are not after all vicious and we very easily get excited and upset. But to carry on all through the situations and yet not get mentally disturbed would be better. “The word Tapa means ‘fire’, ‘heat.’ Why should we do Tapa? We want Ananda, happiness and relaxation in life. But it is said that life itself is a Tapasya. The world cannot work the way we want it to. Situations happen; it is up to us whether to become tense or not. So firstly to remain balanced in this world, we need to do hard work and this hard work is called Tapa. Many times we feel like saying something but we don’t – When the boss or our elders are shouting at us. Even when small children do something wrong, we know they are small and so we keep quiet and bear it. We adjust, tolerate and wait for the right time to explain to them. All these things that we do by putting in conscious effort to control ourselves, is Tapa. In some cases, more hard work is required – if we keep making the same mistakes again and again, we need to do Tapa. For example, food is our weakness. If food is tasty, we overeat. We do so much planning and preparation in making food. We travel far to specific restaurants to eat specific food. Why not just have simple food at the right time. Its preparation also doesn’t take a long time. In this case, animals are better than us. They eat only when hungry, whereas we fill up the stomach and then immediately think of our next meal. Almost every religion talks of Tapa in food through fasting. But we are so clever that we even make special fasting food which is very tasty. The purpose of fasting is to think of God, not of food, but our mind does not go there. So when fasting, have fruits, milk, lemon juice, eat on time, be disciplined and don’t think of food and taste. So Tapa is not just in anything, we need to apply it to our weaknesses, where we need it the most. Speech is also a weakness. Remember the statue of Lord Ganesha. He has large ears to listen, sharp eyes to see. So don’t speak, observe more. Observe Mauna. A lady once told me that she observes Mauna for 6 hours every day. I said, good, when do you practice it? She said at home, when no one is in the house! It does not help at that time. It especially applies to when we really feel the urge to speak. These are more gross things for physical management. Now yoga talks of more things, like our tendency to worry. Thinking (Jnana) and Action (Karma) should go hand in hand. But we think more, worry more and act less. Limit the time you want to worry to 15 minutes, then let it go; don’t continue it throughout the day. Many people are too look conscious, some keep seeing negative in everything and everyone. The aspects of our personality which bring us pain are those in which we need to do Tapa. Don’t fast or do Tapa to show off. In fact, in a city like Mumbai more than fasting, eating simple meals at the right time is better. After fasting, sometimes ego increases, but discipline will bring balance. A. Dr. Jayadeva – These are Niyamas and they give us internal strength. Smt. Hansaji – It is observed that sometimes because of Tapa, ego increases. So Swadhyaya becomes necessary to increase understanding and to learn to surrender the fruits of our efforts to God. So these 3 things – Tapa, Swadhyaya, and Isvara Pranidhana go together. A. Dr. Jayadeva – Reducing thoughts in itself is a Tapa. Smt. Hansaji – If thoughts are coming, close the doors of the mind. Watch your breath. Yoga techniques will help. Guide the mind on thinking only on one chosen subject. 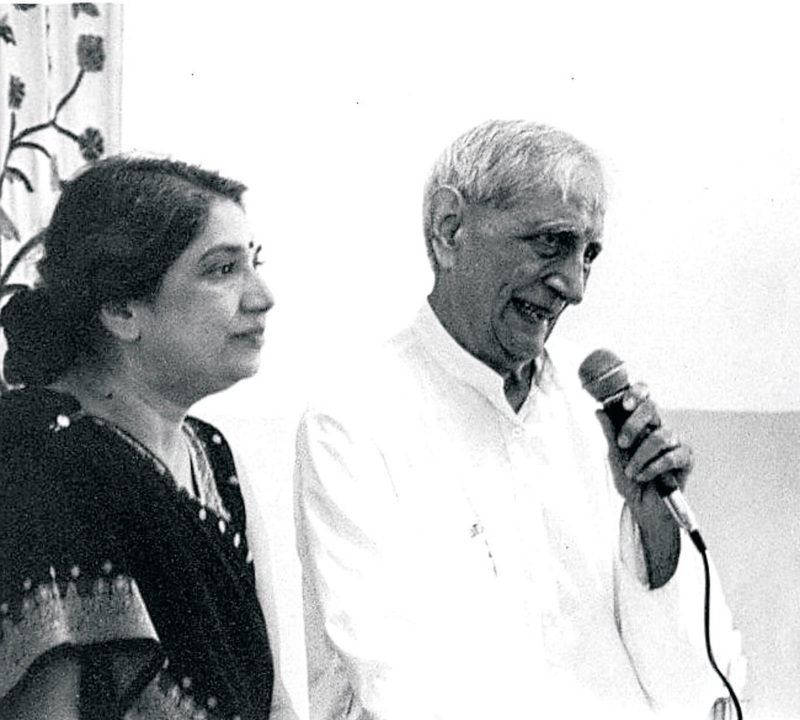 A. Dr. Jayadeva – Practice yoga. That’s the answer. Smt. Hansaji – Follow the path of yoga and everything should be fine. A. Dr. Jayadeva – Actually this thing creates strength in us. So sometimes you will see if you are personally observing Mauna, others are more careful and even afraid. Smt. Hansaji – Thinking you will be taken for granted is wrong. A person who is silent, thinks before speaking, speaks in few clear words, his words carry a lot of wright. Others will respect and listen. This is not a weakness, it is a strength. A. Dr. Jayadeva – Wife living with stubborn husband is also Tapa. Smt. Hansaji – It is true- if you find the other stubborn, there is some stubbornness in you also. But you should know hoe to handle the situation if someone is stubborn. Do Swadhyaya and Isvara Pranidhana. Q. If a person is mentally disturbed, shouldn’t he vent out his disturbed feelings and emotions? Or should he control it and cause suppression? A. Dr. Jayadeva – If he’s mentally disturbed, he should go to a psychiatrist. Smt. Hansaji – Yoga does not talk of suppression. It talks of action at the right time, in the right manner. Temporary suppression is needed. When you are remaining in a situation, you are doing some Swadhyaya ad thinking of how you should handle the situation. A. Dr. Jayadeva – Well, you don’t want to continue that attachment, you restrict yourself. Restrain. Smt. Hansaji – Restraint is important. Reaction has no place. It is an animal instinct. A. Dr. Jayadeva – Well, if you know that you are going to cause that kind of impression, don’t be in the presence of that person and just keep quiet. Smt. Hansaji – Never act under the influence of anger. Sit quietly, do some activity to divert your attention. Then sit and think if the situation repeats, how you will manage it without anger. It is a question of educating, training and uplifting yourself. Effort and disciplining is required. A. Dr. Jayadeva – You could arrange the things, put them back in the way they should be. Smt. Hansaji – If things are not in place, what are you doing? Don’t demand of others that they should put things neatly. Children like staying in mess, they get bored of keeping things neat and tidy. Ladies of the house can also clean the house maybe once or twice. It is your house also. When you come home, keep it tidy yourself. Be a role model. Be self reliant.